Happy Halloween everyone! Here in Sweden we don't really celebrate Halloween but I still love the celebrations and all the fun spooky stuff that surrounds it. 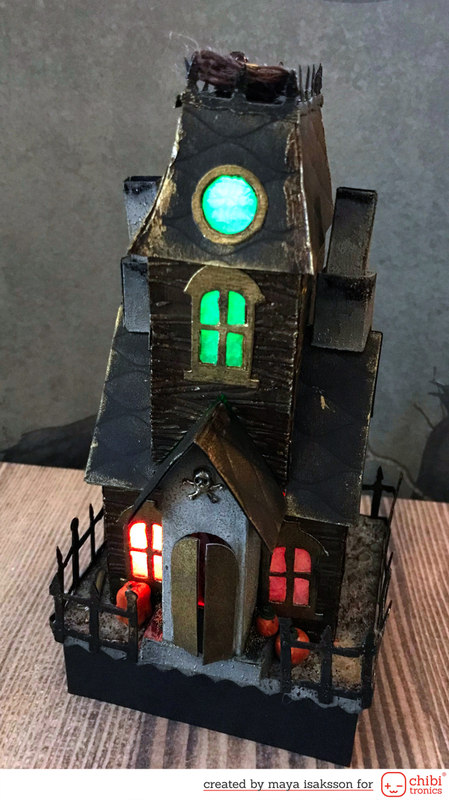 Today Chibitronics and Sizzix are having a collaboration and a I really really wanted to make a haunted house using the Tim Holtz dies. I mean, look at the house! It's so cool and and with Chibitronics I could make it light up too. So I started building and soon discovered that I just wanted to keep adding details to it. Here's a warning. This is a picture heavy post with pictures of both constructing the inside electronics and a lot of pictures of the outside. Don't tell me I didn't warn you! As you can see all the window lights up and I used different colored LEDs for different windows and also different effects for different windows. You can check out the video to see it in action. It's really super cool, and the secret is the ChibiChip that makes it easy to program each LEDs behaviour. It's not hard at all, but if you aren't into programming (which you should be because it's super fun!) then you can use the effect stickers to achieve a similar effect. I made a birds nest for a thieving magpie to hide it's treasures, some little trinkets I had laying around. The nest is made from twine dipped in matte medium and wrapped around my finger and left there to harden. 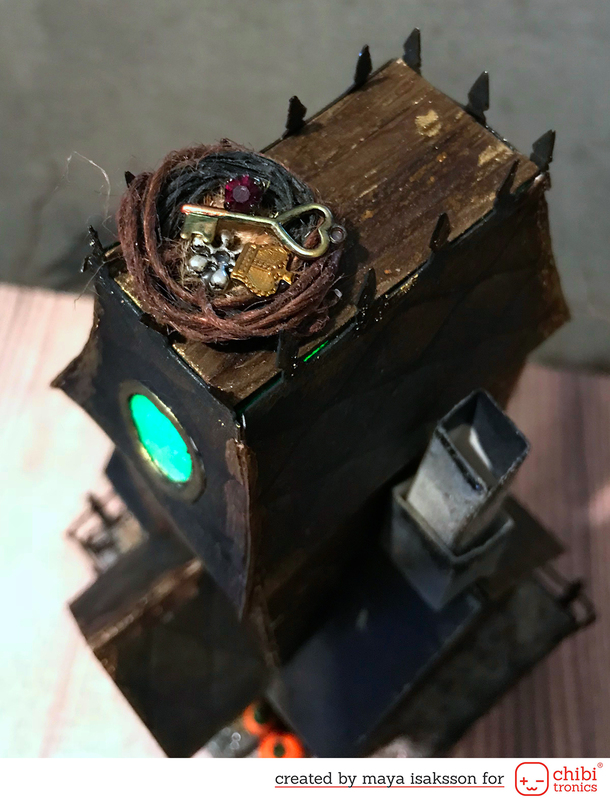 I found a small tombstone in my charm box and colored it grey and added some dry grass. Packing twine cut up inte short section creates a yellow-brownish dried grass that you can glue down. And can you spot the sword in the background by the front? I made the cracked window panes using vellum and covered it with crackle accents. I went through the kids pearls and made pumpkins out of them. The larger one was already pumpkin shaped so I just painted it and cut off the top ring. The smaller ones I painted and then rolled up green paper and put inside to act as stems. The ground itself is embossed first, using an embossing folder with round polkadots. Then I painted it and added structure by dotting my finger on the paint before it dried. I also added some different types of Distress Stickles in earthy colors and some gold micro beads that I toned down with some diluted black paint. And I cut some more of my string to create patches of dried grass. 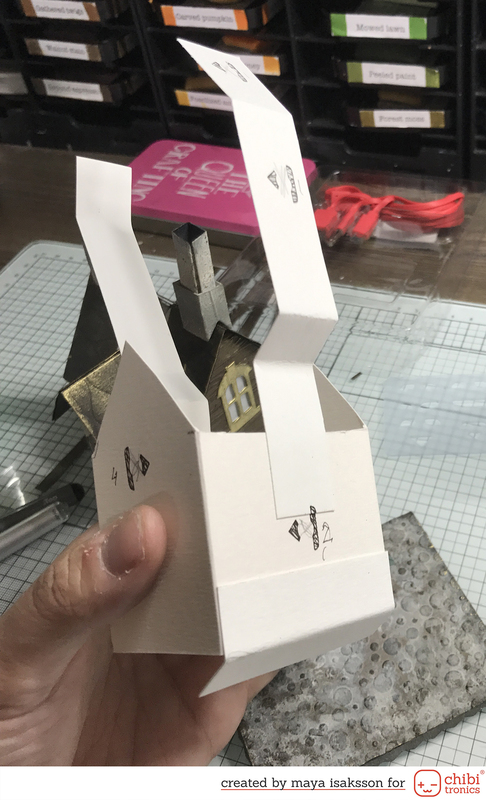 To build the house itself I started out by cutting everything out in just plain white thick cardstock. I built the house following the instructions. 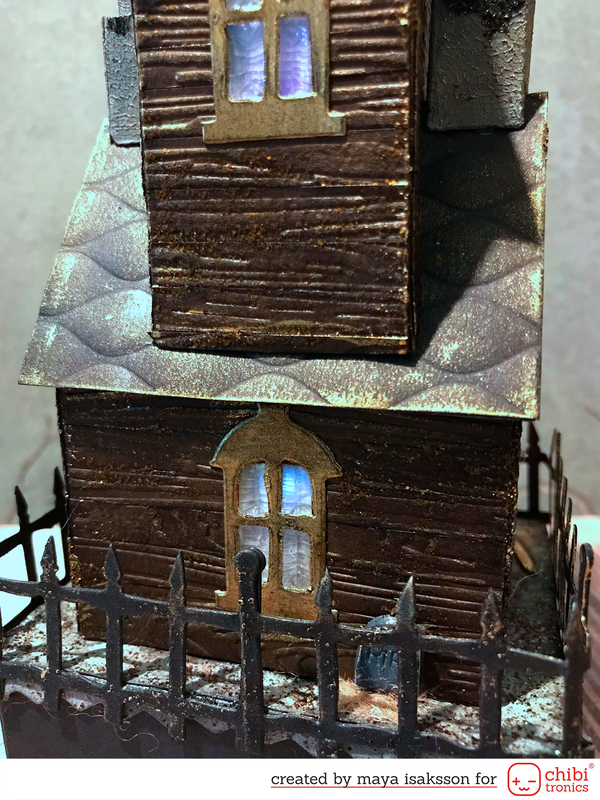 Then I made wooden boards by embossing a piece of brown cardstock, cutting it into strips and then using distress ink to darken the edges a bit before gluing them to the house. 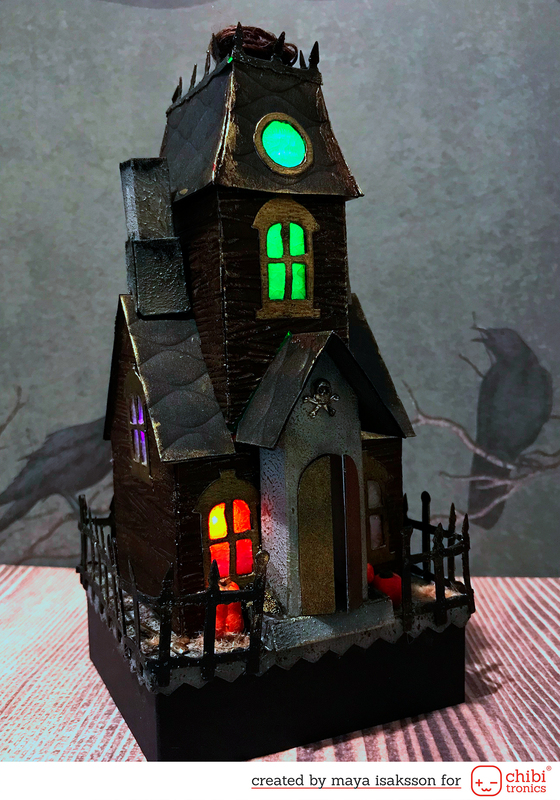 I also embossed black cardstock for the roof. 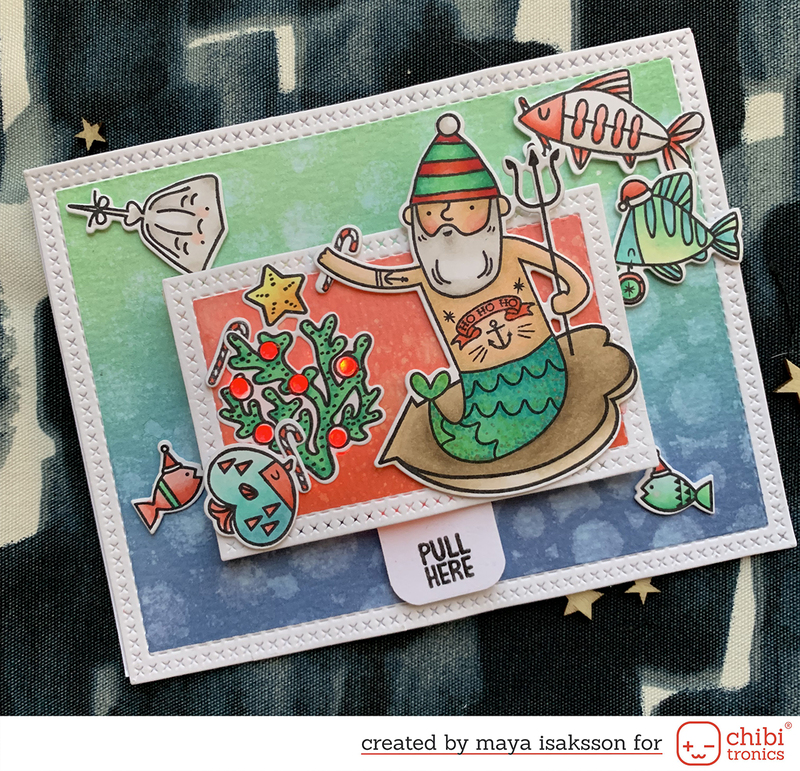 I used an WRMK next level embossing folder for that, it looked a bit like tin roof. 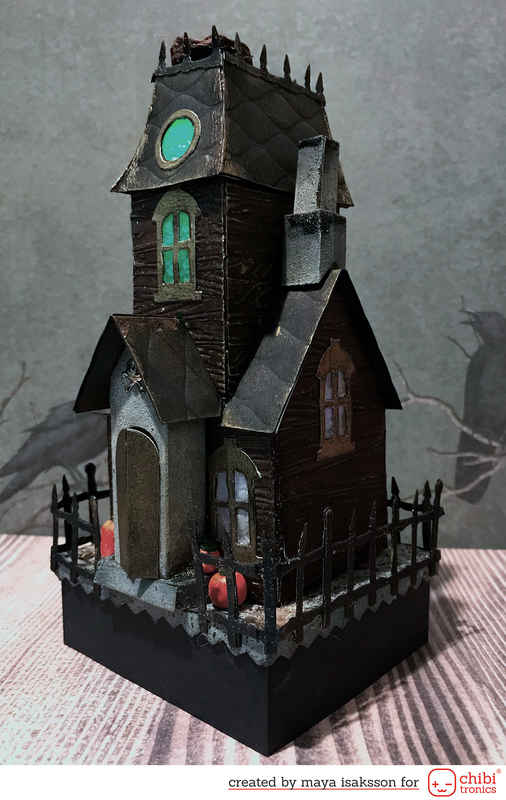 For the front porch piece and the chimneys I colored it using gesso that I dyed grey and applied with a finger, just tapping the cardstock to create an uneven surface. I added gilding vax to everything to bring out the details and then I also added some different brown and black Distress stickles so it catches the light in some angles. The door and the window trimming is coated with a thicker layer of gilding vax. I also added a black raised platform to be able to fit the ChibiChip under it. For the inside I created a slightly smaller house and marked the placement of the windows of the outer house. I also cut a hole in the roof of the outer house to be able to light up the top windows too. That's what the long flappy thing goes. Here's a video so you can see what the inside part looks like all the way round. 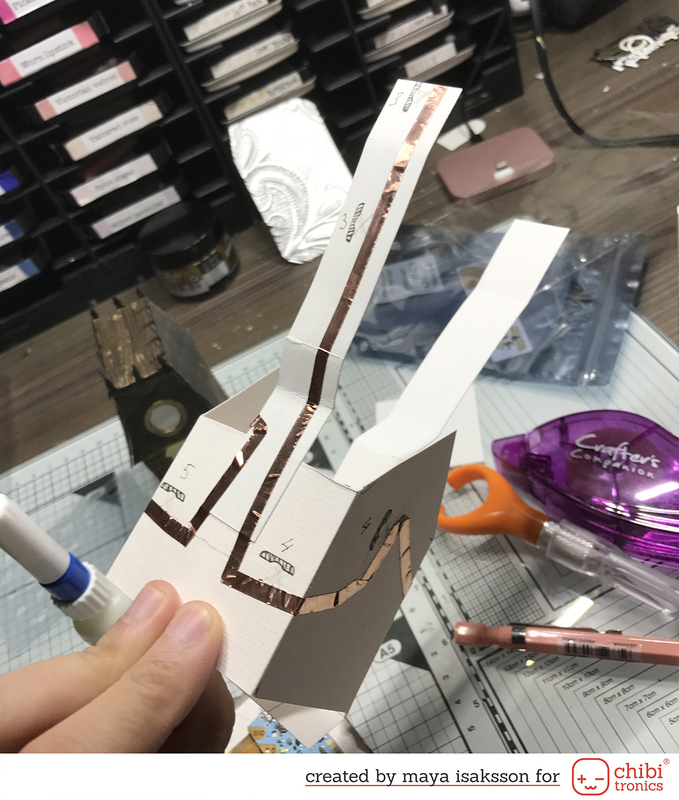 When copper tape overlaps I build bridges using washi tape so they won't touch. 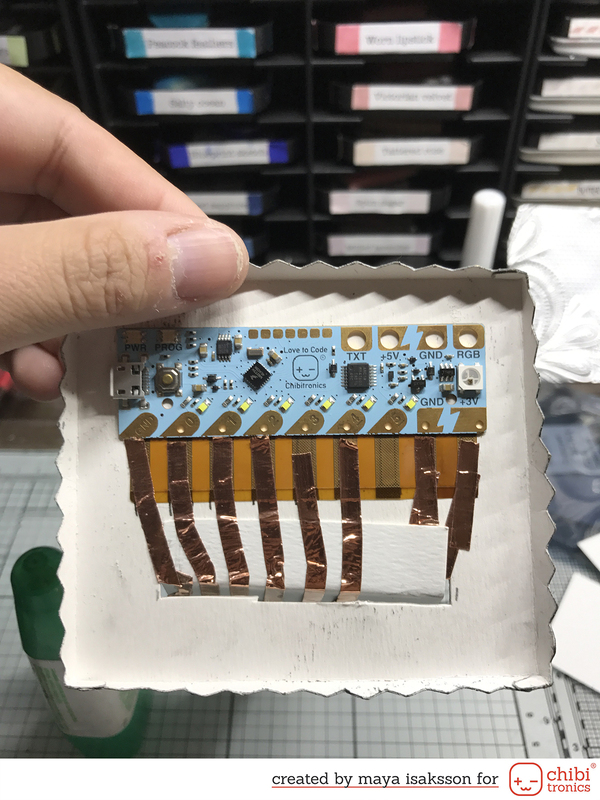 I wanted to make sure you was able to change the batteries when they ran out so I made the battery holder inside the inner house and made hinge for it to be able to flip up to change it. I have cut a hole in the bottom plate to allow the copper tape to reach the chip on the under side of the platform. 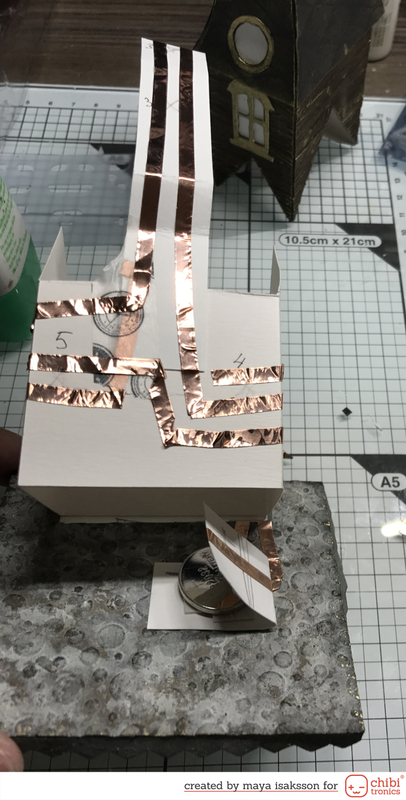 The hinge also works to allow the copper tape to go over it down on the underside. I also marked what LED was which, using numbers, so I knew when later programming them. Here's the underside with the ChibiChip. Each number corresponds to one (or in some cases two) LEDs. And the GND is the negative for all of them. I made one long strip connecting the negatives leading to the left ground connection. The GND on the right side and the +3V connects to the battery. So the battery powers the chip that tells what lights to light up. You program it by connecting it to the audio port on your computer or any device really. It's really easy, there are great instructions on how to connect and code the chip here on the Chibitronics website. Ti make the house not move around on the base I cut two slits in the base plate and attached strips of cardstock that I glued to the house. I can push down the cardstock flaps into the slits and fold them to keep the house secured to the ground. when I want to change the batteries it's easy to just lift the house up and flip the inner house to the side and change the battery, and then just put back the house once again. I hope you enjoyed my project. It is by far the funnest one I have made in a long time. These houses are so much fun. My 9 year daughter was building a house before I even got to use the dies, she was super happy to get to make it her own way and had no problems figuring out how to do it. Hers does not light up but it's super cute. 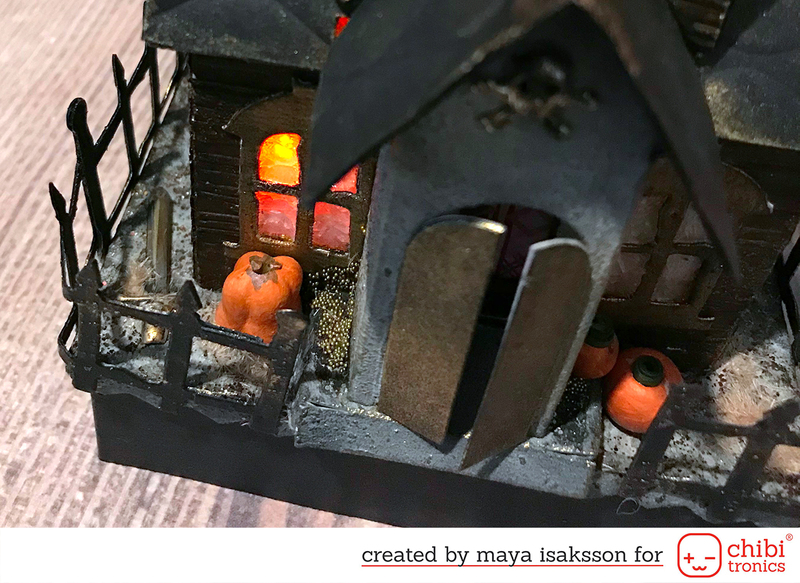 Please stop by the Chibitronics blog for links to my DT friends who also built some amazing houses.